The beauty box addiction continues my friends. This time I’m trying the Be(YOU)tiful box from Target. Target keeps it simple with their boxes, they send you 7 sample-sized products for $7, which makes these Target beauty boxes perfect for trying new products without commitment. 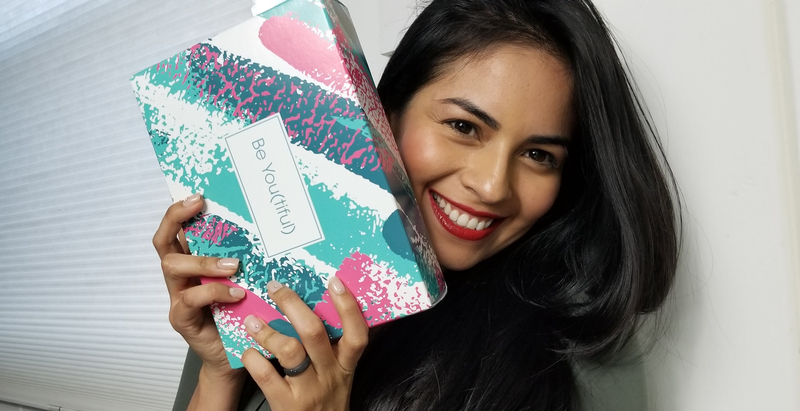 Target curate the Be(YOU)tiful box to help you shine your beauty from within. 1.OLLY Undeniable Beauty Gummy – 1 ct: I love gummy bear vitamins! Swallowing pills is so 2002. I have never enjoyed regular vitamins, even the old school Flinstone vitamins were the worse. ew! I’m all about a yummy treat and helping my hair and nails grow (these gummies are packed with Biotin)! 2.Nexxus Keraphix Shampoo – 3oz: I haven’t tried this shampoo and conditioner duo just yet, but I’m super pumped to try them over the weekend. I’ve heard amazing things! 3.e.l.f. Gotta Glow Lip Tint in Perfect Pink – full size 1 ct: Uh, I always cringe when there is a lip product in my beauty boxes. I’m so picky when it comes to lip products, I totally prejudged this product. I thought this was a super pink lipstick, but it actually goes on clear. Basically, this is chapstick, and I never say no to chapstick. 4.Simple Water Boost Micellar Makeup Remover Eye Pads – 30 ct: Removing eye makeup is the most tedious task ever, it’s like putting gas in your car, everyone wants to drive with pretty eyelashes but not stop to pump gas. I’m going out of town on Saturday, so these wipes came at the perfect time. Long nights make me so lazy, so these are gonna enable my laziness by helping me remove my eye makeup easily. 5.Honest Beauty – The Younger Face Deep Hydration Cream – 0.17oz: I loved this moisturizer! Loved – becauseI already used the whole sample tube. I’ve always wanted to try Honest Beauty, so I was super excited to see this little guy in my beauty box! 6.Sinful Nail Color Galac Sea or Wondermint – full size 0.5oz: So, I’m not a big fan of green glittery nail polish. I probably won’t wear it until Christmas, but hey at least my nails will be in the spirit this holiday season. 7.L’Oreal Pure Clay Cleanser – Detoxify and Brighten – 0.5oz: I actually have been itching to try L’Oreal products lately, so I’m super excited to try this clay cleanser. I’ll let you guys know the verdict soon! If you’ve tried any of these products and which one was your fave. Keep radiating your light and shine bright from the inside out!